Cloud based anti spam software is the most cost-effective way to mitigate the risks from email-borne threats such as malware, phishing and ransomware. Provided as “Software-as-a-Service”, cloud anti spam solutions have no set-up costs, minimal maintenance overheads, fully automated updating and eliminate the need for client based software by protecting the network as a whole unit. Taking just minutes to implement, cloud based anti spam software is managed via a centralized multi-level administration portal. Via the portal, network administrators can select and adjust appropriate acceptable spam thresholds by user, user-group or company-wide, choose how quarantined email is managed, and pull reports to identify risks from both outside and within the network. Cloud anti spam solutions use various mechanisms to mitigate the risk from email-borne threats, but not all solutions are the same. Most use Real Time Blacklists (RBLs) to prevent the delivery of emails from known sources of spam, and allow administrators to apply Sender Policy Frameworks and recipient verification tools to prevent email spoofing and reject emails sent to non-existent company addresses. It is also common for cloud anti spam solutions to include antivirus software among their online security mechanisms to check for malware hidden within email attachments. Some also include phishing protection and malicious URL detection to check links within emails that could be potentially unsafe. However, in order to maximize network protection, a cloud anti spam solution should also include “greylisting” among its features. “Greylisting” is a process in which every inbound email is initially rejected. The email is returned to its originating mail server with a request to resend the email. Spammers´ servers are often too busy to respond to the request, and the rejected spam email is never returned. By eliminating spam emails from “as-yet-unknown” sources of spam as well as known sources of spam, cloud based anti spam software with greylisting can achieve spam detection rates in excess of 99.9%. One other feature not always present in cloud anti spam solutions is outbound scanning. This is an important security mechanism for two reasons – the first being that outbound scanning will identify any attempt by cybercriminals to compromise email accounts and send malware to clients and other contacts from a trusted source; i.e. the company´s email account. The second reason is that it is not inconceivable an employee could introduce a virus to his or her desktop computer and distribute it in outbound emails throughout the network and beyond. This may not be a deliberate action. The employee could have been working on a file from a malware-infected home computer, and brought the virus to work on a USB flash drive. Whatever the source of an infection, sending out malware-infected emails can have serious implications for a company. The company´s IP address or its entire domain could be black-listed by ISPs and email service providers, resulting in a loss of business and a loss of credibility. Reversal of the blacklisting process can take up to a week, potentially costing a company a significant amount of money. SpamTitan´s cloud anti spam solution is a complete cloud based anti spam software package. It includes the full range of mechanisms mentioned above to protect networks from inbound email threats and performs outbound scanning to prevent the scenario in which a company´s IP address is blacklisted. SpamTitan´s cloud based anti spam software can also help enhance employee productivity. Research has shown the effect of spam email on productivity can be significant. In addition to the risk that an employee may inadvertently open a spoofed email and expose the network to malware or ransomware, it takes an average of four seconds for a security-conscious employee to identify and delete a spam email. For a company with two hundred employees – each receiving six emails per day – this can mean 50 days of lost productivity per year. 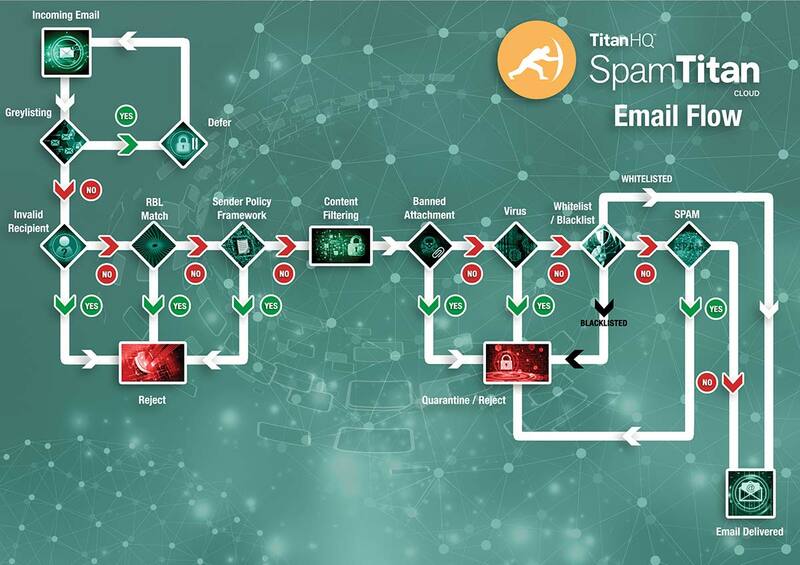 With a verified spam detection rate of 99.97%, SpamTitan eliminates practically all spam email – minimizing the risk from email-borne threats and productivity loss. At a typical cost of less than $10.00 per user per year, SpamTitan represents the most cost-effective of all cloud anti spam solutions – both for companies who implement our cloud based anti spam software directly and for Managed Service Providers who have the opportunity to white label SpamTitan as their own product. If you are in the process of investigating cloud based anti spam software, and would like the opportunity to evaluate SpamTitan in your own environment, we invite you to take a trial of cloud anti spam solution for free. Simply click on the “Start Free Trial” button above and follow the instructions, or contact us for further information about our free trial and to ask any questions you may have.